Again this year Help! 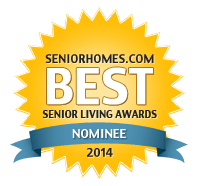 Aging Parents has been nominated in the Seniorhomes.com Best Senior Living Awards 2014 “Best Blogs by Individuals” category. We were honored to be judged the sole first runner-up and part of a 3-way tie for first runner-up in this category in 2012 and 2013 respectively. How this works: Initially it’s sort of a popularity contest which, this year, ends April 28th. A certain number of popular votes qualifies us for the judging round. After that, it’s up to the judges. Meanwhile, there’s a virtual universe of informative, humorous, personal, and commercial blogs and resources that focus on various aspects of aging. You can check them out by clicking on the badge above. It’s a win-win for everyone……and of course, we appreciate your vote which, as you will see, is via Facebook.